Fortune Cookie and Fortune Cards are an interesting pair of craftable items that perplex me. Fortune Cookies are a nice consumable that will be created by the cooking profession. These Fortune Cookies require 1 Simple Flour and 1 Mysterious Fortune Card for each cookie. The Simple Flour can be bought at any cooking vendor, but the Fortune Card must be crafted by a scribe through the inscription profession. The Mysterious Fortune Card only requires 1 Resilient Parchment and only 1 Blackfallow Ink, which comes from the pigments of Cataclysm herbs. I myself like to craft these type of items for profit because the interaction of requiring multiple professions tends to lower the number of competitors. A good current example is Fused Wiring, which requires a jewelcrafter and an engineer to craft, and aren't typically a heavy competition item on the auction house. To Gamble, To Cook, Or Both? Now for the perplexing part. The Mysterious Fortune Card is a new form of World of Warcraft in-game gambling. Just crafting the card itself, you can sell it outright to gamblers or gamble yourself. Using the Mysterious Fortune Cards give you 1 of 58 possible vendorable Fortune Cards that sell for anywhere from 10 silver to 5000 gold. Yeah, you didn't misread that. 1 Mysterious Fortune Card can turn into 1 Fortune Card, which will vendor for the nice sum of 5k gold! Fortune cards can vendor for 5k, 1k, 200g, 50g, 20g, 5g, 1g, 50s, or 10s. So in a sense it is gambling for gold. The option other than gambling is to use the Mysterious Fortune Card to create a Fortune Cookie. These cookies give a nice 1 hr buff of +90 Stamina and +90 to a player's prime stat. The crazy thing is once you eat the cookie you receive a Fortune Card just like if you had used it gambling. The card from the Fortune cookie is the vendorable version, not the reagant version. 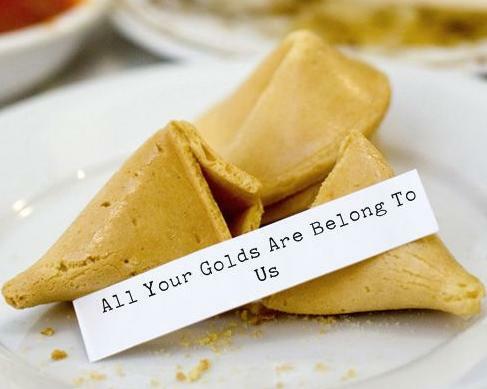 As auctioneers we need to be on alert and watching the markets for both Mysterious Fortune Cards and Fortune Cookies. If you are looking to gamble and try your luck at getting a profit from these cards, then instead of buying or using the Mysterious Fortune Cards it may be cheaper at times to just buy the Fortune Cookies and eat those. If the auction house market was in equilibrium, then the Mysterious Fortune Cards would be near the same price of the Fortune Cookies. I am sure we will have some chances to play within both of these markets as players will be unaware of this relationship. Scribes and cooks both should see nice demand and profits from both of these items. There could exist other options for using these Fortune Cards. The 5k ones will be rare, but instead of vendoring for 5k you may be able to hold these and sell for a little more than 5k. Why? Players that are transferring servers are only allowed to transfer with a maximum amount of gold. Therefore, some transferring players may be looking for high value items to take along in a non-liquidated form to further maximize the starter gold on their new server. Anyone else got a creative idea for these Fortune Cards or Cookies? Great Idea on using the cards to move gold around. As some people have multiple accounts for cross faction trading and such they may also find these a way to get around the occasional ban one may receive for trading himself large amounts of gold. The mats for the cards, however, are subject to being boted. So while you may find a few players changing servers that will find them handy I would not expect many gold sellers to be actively buying them and instead they may simply craft them with stolen scribe accounts. I had dismissed those cookies as a mere fun item, but I should've known better. Is there anything known about the probability of th single cards? I theory, there shouldn't be much to lose once the Blackfallow prices have stabilised, so I'm taking a close look at those cookies - especially since I assume that most people will consider them fun items, too! I'm shocked and disgusted at you, Cold. You're advocating help gold sellers! Be careful where you tread, because you're going down the wrong path currently it seems. I'm not advocating anything related to gold sellers. I'm just saying that there could exist a legal and viable market supplying those snarky bastages that do sell gold. If I was an advocate of gold selling and buying, then I wouldn't have shot down the Advertising Offers I have been getting by gold sellers looking to pay me to host a link to their gold selling sites! Blizzard finding sneaky ways to hide or ignore goldselling is nothing new. Because all those players running around grinding a single type of mob for weeks and even months on end without responding to any inquiry or being ganked and being reported by dozens of people multiple times are totally human and not playing on stolen accounts.